In the mid 1900s, Nile Creek was known locally as the Pink River, due to the large numbers of Pink salmon that returned to spawn. These numbers began to decline and, by 1994, there were no Pinks, few Coho and only some Cutthroat Trout in the creek. This provided the stimulus for the restoration and enhancement of Nile Creek, through the formation of Nile Creek Enhancement Society (NCES), which was incorporated as a non-profit society in August of 1996 and later obtained charitable status. Department of Fisheries and Oceans (DFO) recommended that NCES incubate Pink Salmon. An incubator box was installed in the fall of 1996 with money from DFO. The hatchery began with a donation of 568,000 Pink eggs from the Quinsam River Hatchery in Campbell River. In 1997, silt and debris, caused by construction of the new Inland Highway, negatively impacted the creek. Remedial actions, in 1998, included a 700-meter side channel built with a donation from the Steelhead Society and a monetary settlement from the Department of Highways. This channel remains valuable spawning habitat. In January 1998, a shelter was built over the incubation box with funds and labour donated by Mid-Island Castaways Fly Fishing Club and, in 1999, Enhancement Society volunteers planted low-growing native trees, donated by BC Hydro, that would provide shade, bank stability and food for the fish. Over one thousand trees and the same number of native shrubs have now been planted along the side channel. Between 1999 and 2003, a 600-metre extension side channel was built, along with the enlargement of several rearing ponds and the placement of additional spawning gravel. We have hatched and released over 12,000,000 Pink salmon, and have continued to see large returns of adults. 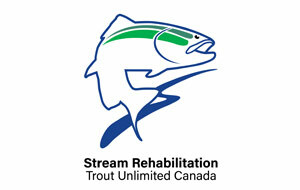 As well, there have been increases in Coho, Chum, Cutthroat Trout and Dolly Varden in the creek. NCES has been supported local volunteers, along with funding for the many projects and activities by donations and grants from societies and companies, such as Pacific Salmon Foundation, Friends of the Environment Foundation and others. along with local community and business support.